The northeastern side of the Big Island is lush and tropical thanks to a combination of the high volcanoes, constant trade winds, and tropical temperatures. The Hilo and Hamakua coast are filled with rainforest, waterfalls, and tropical flowers and these natural treasures can be most easily seen in one of the botanical gardens on the Big Island. Botanical gardens vs. gardens vs. arboretums: what is the difference? Botanical gardens, gardens, and arboretums. What is the difference? Botanic gardens are institutions holding documented collections of living plants for the purposes of scientific research, conservation, display, and education. We are quite relaxed with this definition, and all but two of the gardens in our list make it to the ‘botanical garden’ side. The only two that don’t make it are the Akatsuka Orchid gardens, whose main purpose is selling orchids, and the Liliu’okalani Gardens, which is a Japanese garden inside a public park. Both these places are still very pretty to explore, and that is why we keep them on the list. An arboretum, finally, is a botanical garden but for woody plants (trees). Basically, it is a collection of trees that are special for one reason or another. There are botanical gardens spread all over the Big Island, and you will very likely pass close by a couple of them during your travels on the island. Visiting one during your stay then only takes some smart planning using the following map of botanical gardens on the Big Island. On the following map, botanical gardens are marked as a pink flower, normal gardens are marked with a green flower, and arboretums are marked with a dark green palm tree. Each of the gardens is described in more detail below the map. You can find the following botanical gardens on the Big Island. Most botanical gardens are close to Hilo, but you can also find two close to Kona, and even one in the hot and dry Kohala coast! This is hands-down our favorite botanical garden on the Big Island and is also one of our 5 favorite short hikes on the Big Island. If you don’t like walking that much you can also see it as part of one of our favorite scenic drives. 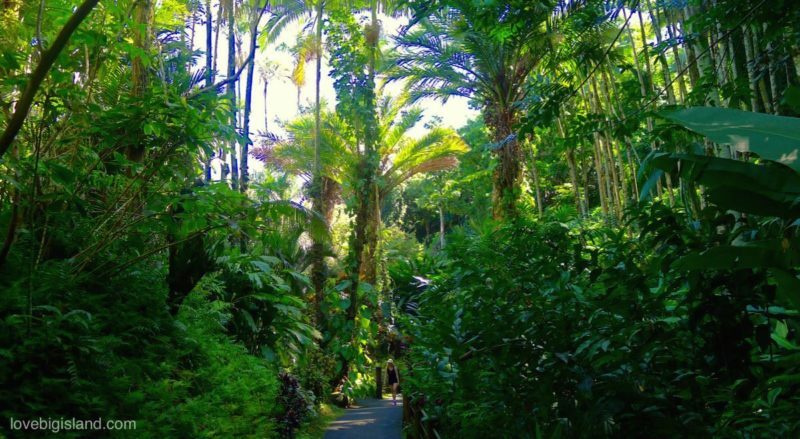 The HTBG features over 2,000 species of tropical plants all inside a 40-acre valley. The Garden is dedicated to the collection and display of the world’s tropical plants, and to the education of both children and adults about the plight of the world’s rainforests. The entrance fee for one day is $20 for adults, children ages 6 – 16 are $5. Children under 6 are free (2018 rates). The gardens are opened daily between 9 am and 5 pm, but the latest admission is at 4 pm. To get here from Hilo turn makai (towards the ocean) between mile marker 7 and 8 on Hwy 19, onto the scenic drive in the direction of Onomea Bay. Continue for 1.75 miles to reach the Hawaii Tropical Botanical Gardens. Hawaii tropical botanical gardens website. This is a free zoo and botanical garden in one! Next to being the only tropical zoo in the United states (read more about the Pana’ewa zoo on our website) this place also doubles as one of the most enjoyable botanical gardens on the Big Island. While walking through the park (reserve about 1 hour) you can see over 100 types of palm and many varieties of vireya (tropical rhododendron), bamboo, orchids, and bromeliads. There also is a small native forest of trees and plants and an agro-forest of edible varieties. 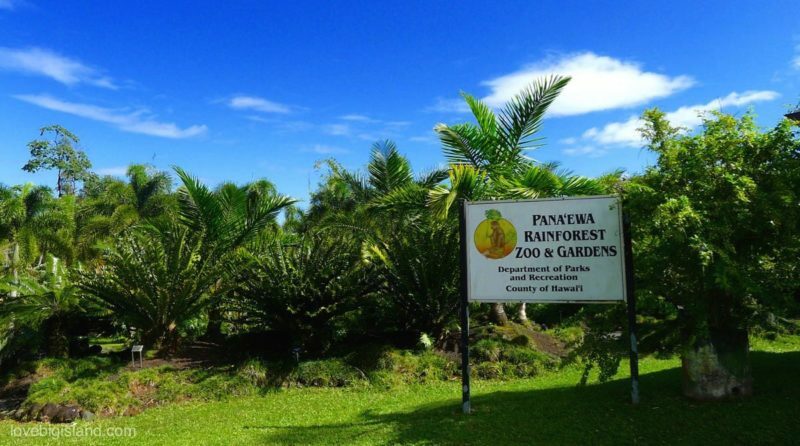 The Pana’ewa rainforest zoo is a zoological and botanical park specializing in rainforest and native species. Admission to the zoo and the botanical gardens is free, but donation are welcomed. They are open between 9:00 AM and 4:00 PM daily, but close on Christmas and New Year’s Day. The botanical gardens at UH Hilo were started in the 1980s by one of their professors when a student in a freshman biology course asked him “What’s a pine tree? The UH Hilo Botanical Gardens consist of three separate areas that feature cycads, bromeliads, and palms. Currently, they include one of the largest collections of cycads in Hawai’i with over 100 species. One section of the garden has over 40 species of Zamia from Mexico and Central and South America and other sections contain rare and endangered Encephalartos and Stangeria from Africa, Macrozamia, Lepidozamia, and Bowenia from Australia, and Cycas from China and Vietnam. The university welcomes visitors every day of the week and admission to the gardens is free. The largest garden is located off Lanikaula Street, between the Science and Technology Bldg and the Hale Kehau Dining Room at the Nowelo street entrance. Please note that visitors who wish to park on campus during business hours must have a parking pass. A daily parking pass can be purchased for $3.00 and obtained at the parking booth at the main entrance to campus, which is located off of Kawili Street. The World Botanical Gardens are commercial botanical gardens with a 100 ft on-property waterfall: the Kamaʻeʻe Falls. 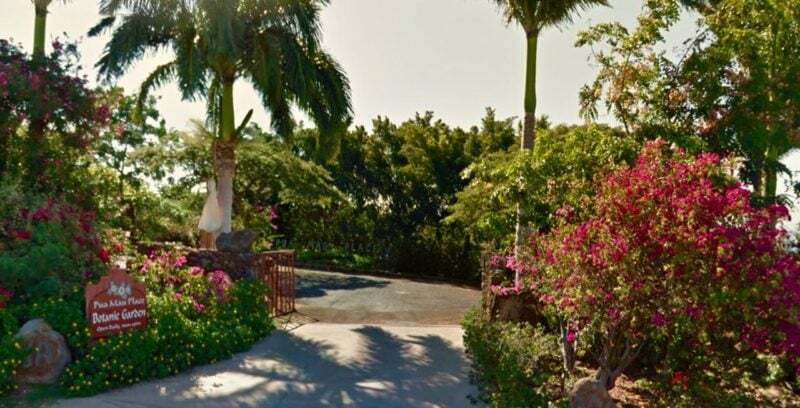 The gardens are situated on 300 acres of former sugarcane fields on the Big Island and are home to a 10-acres maze and many specialized garden areas. Admission to these gardens is not free. You can buy a self-guided garden tour day pass for $15 (adults), $7 (teens), or $3 (children). You can also see the gardens as part of a zip line guided tour. Situated on Highway 19 just 16 miles (26 km) north of Hilo, the gardens sit between the slopes of Mauna Kea and the Pacific Ocean. For more information see their website. The Pua Mau (literally: ‘ever-blooming’) botanical gardens sit on the western slope of the Kohala Mountain. The Pacific ocean is less than a mile to the west giving you an 180-degree view of the ocean, the weather is sunny, and the land is arid and dry. The garden features a maze planted with over 200 varieties of hibiscus, outdoor sculptures, and an aviary with about 150 peafowl and guinea fowl. Plants are marked and an information booklet is available. If you are visiting in the months between December and March you can also try some DIY whale watching here. The deck of the visitor center is a great place to sit down for a while and try to see whales breaching the ocean surface. The gardens are open every day of the year between 9:00 am to 4:00 pm. A tax-deductible donation of $15 is requested at the gate with lower rates for seniors, children, and kama’aina. The gardens are located on the northern tip of the Big Island. To get here follow Hwy 270 up north and stop at 10 Ala Kahua Drive. More information at their facebook page. The Amy B. H. Greenwell Ethnobotanical Garden closed their doors to the public in 2016. They may reopen again at a later time. If you are passing by, you can also stop at the Kona coffee living history farm across the street for a Kona coffee farm tour. The Sadie Seymour Botanical Gardens span 1.5 acres and give an overview of the native and non-native plants that inhabit the Hawaiian Islands. It is built in a series of terraces going down the mountain, each devoted to a separate ecosystem, e.g. native Hawaiian, Polynesian, South American, etc. The property is also home to the Kona Outdoor Educational Center and a Thrift store. The botanical gardens can be difficult to find because of the lack of signage if you don’t use GPS. Keep your eyes open for the thrift store flag at the top of the driveway and park on the upper level for the garden. If you pass by and like to see botanical gardens make sure to stop here, but don’t plan your trip around these gardens. The botanical gardens at the Hilo side (especially the Hawaii Tropical Botanical Gardens) are far more impressive. Admission to the Sadie Seymour Botanical Gardens is free but donations are accepted. Address: 76-6280 Kuakini Hwy, Kona Outdoor Circle Educational Center. Phone number: 808-329-7286. 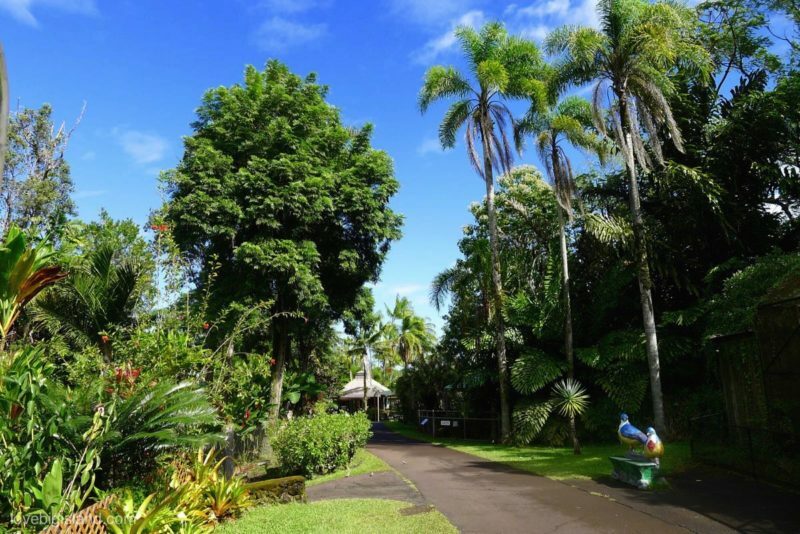 The Nani Mau gardens cover 20 acres and include an anthurium grove, a Japanese-style bell tower, a botanical museum, a butterfly house, a European garden, a fruit orchard, a ginger garden, a hibiscus garden, Japanese gardens, an orchid display, palms and coconut trees, and a water garden. You can find the Nani Mau gardens at 421 Makalika Street in Hilo. Admission to the gardens is $10 for adults but discounts are available. Website of the Nani Mau gardens. The Paleaku gardens are a 7 acre botanical garden with many plants and trees endemic to Hawai‘i. Throughout the gardens you can find multi-denominational statues and shrines meant to illustrate the beauty of all the world’s cultural and spiritual traditions. You can read more about the Paleaku gardens in this Ke Ola Magazine article, and get a preview of the gardens with this virtual tour (using google maps). You can find the Paleaku gardens at 83-5401 Painted Church Road in Captain Cook. This is right in the middle of two of our favorite snorkeling spots and close to the picturesque small painted church. Admission to the gardens is $10 for adults but discounts are available. The gardens are open to the public Tuesday – Saturday between 9:00 to 4:00 pm and can be explored as part of a self-guided tour. Reservations for guided tours can be made upon request. Website of the Paleaku gardens. The following two places are certainly worth the visit but don’t have as primary purpose the education of the visitor and the conservation and display of many plants and flowers. The Liliu’okalan gardens are a Japanese garden located inside the 30-acre Liliu’okalan park. The gardens contain Waihonu Pond as well as bridges, koi ponds, pagodas, statues, torii, and a Japanese tea house. The park and gardens are located southeast of downtown Hilo and offer great views of Hilo and the bay. Just north of the gardens you can reach the lovely but tiny Coconut Island by crossing a bridge. Both the gardens and the island are good places to take a break whenvisiting Hilo, for example for a picnic lunch. The Akatsuka orchid gardens are a commercial enterprise growing and selling orchids. They offer tours through their gardens that are filled to the brim with many species of orchids. They started charging an entrance fee in 2016, read more about the Akatsuka orchid gardens on our website. Ulu Laʻau (which means “Garden of Trees.” in the Hawaiian language) is a 10-acre large garden in the heart of Waimea town. The purpose of the park is to provide a space for public recreation in Waimea where visitors can learn about the native plants of Hawai’i. The nature park is at 2,600 feet elevation near Waimea’s “dry side” but frequently affected by “wet side” weather patterns, make possible the growing of a wide range of species from both the wet and dry uplands. There are also picnic tables and a greenhouse. Entrance to the park is free and self-guided tour booklets are available on the door of the park office on the right. Please return these booklets when you are done with them and consider leaving a donation for park development and upkeep. The following two arboretums are located inside larger state parks in which there is space for picnics and larger hikes. The arboretum is located inside the Kalopa State Recreation Area, approximately 40 miles northwest of Hilo. The park is 2,000 feet high (weather: damp and cold) and a number of rare plants can be found in the arboretum area, including endangered loulu palms, as well as a number of rare native hibiscus. There is also an easy 0.7-mile loop trail through a forest of native ʻohiʻa lehua trees in the park. As part of the arboretum you can find picnic tables, restrooms, and campsites (permit required) in the park. Kalopa state recreation area website. You can also explore the arboretum as part of a digital walking tour. The Manuka state wayside park is surrounded by the 35.000 acres Manuka Forest Reserve, Manuka State Wayside Park is 13.4 acres with an arboretum. 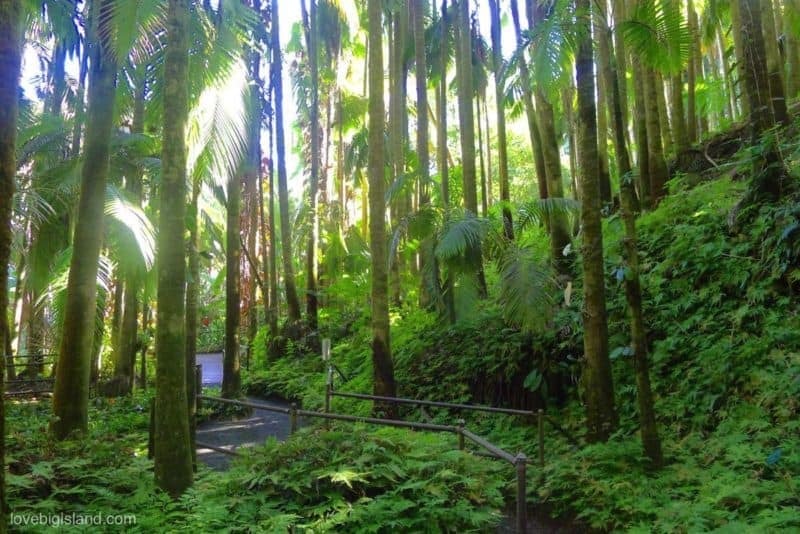 The park also features the Manuka Nature Trail, a two-mile nature hike through the adjacent Manuka Natural Area Reserve which offers an experience in Hawaiian natural history. Camping (with permit) is also possible in the Manuka state park.